Do you know where Moose Jaw is? Picture this: A moose and her calf being chased by an oversized ex-hockey player, being chased by an extremely oversized ex-coach. I sat awed at the site of two grown men trying to get a picture of the mother and baby on the Cabot Trail in the Cape Breton Highlands of Canada’s Nova Scotia. It was a Kodak, eh, Canon- moment, and I’m not referring to the picturesque beauty of the Trail but the site of these two behemoths trying to catch-up to the fleet footed beasts. Rusty (Steel) was a novice photographer, with a hand held point and shoot camera, who jumped from the motor home before the “Big Guy” had a chance to bring it to a full halt on the steep slope of the Trail. I watched in amazement as the “Big Guy” bolted out of the RV and made tracks after our traveling companion, Rusty. Rusty had no idea of the threat he was presenting to the huge cow and didn’t realize the damage she could have inflicted upon him had she decided to get ugly. However, like all Maritimers this big moose was docile and laid back….thank God. The “Big Guy” knew what to expect if she turned to defend her calf, learning the lesson himself in Yellowstone National Park in Wyoming a few years back. He had been escorted from the park by a Ranger when he attempted to photograph a cow and calf alongside of the road just inside the east gate. Even the “Big Guy” admits he was wrong and should have made himself more familiar with park rules, but the hockey player in him was too strong and he didn’t see any danger in his actions. He’s the first to admit it hasn’t happened again and he demonstrates great respect for all wild critters on their home turf. But Rusty was off to the races and the “Big Guy” was in hot, well maybe panting, pursuit hollering at the top of his expanding lungs for Rusty to STOP. Thankfully the cow kept right on going, heading to the ditch alongside the highway and into the cluster of woods. Once the “Big Guy” caught up to the wayward novice he took a minute, well about five minutes, to catch his breath before he uttered his first coherent sentence; “Do you realize you could have been killed?” he blurted out as he gasped for another liter of oxygen. “Killed?” responded red faced Steel. “Killed,” he repeated. At that moment the two mammoths from a by-gone era leaned forward placing their trembling hands on each others shoulders for vertical support, and refrained from any further dialogue until they had regained their respective stability and air replenishment. What a site I thought out loud as I made my feelings felt in my own vociferous way. By the time the two less than athletic looking specimens arrived at the motor home they had regained their breath and composure and had a chuckle. It was easy for them to laugh out loud but no one considered me in their folly. Who would have driven the motor home if one had been killed by the moose and the other died of a heart attack from over exertion? Although I have four legs, the “Big Guy” has still not modified the gas and brake pedals to allow me to reach them even when he needs me to help him drive after a shoot. 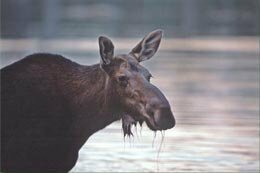 A sedate lecture on wild animal habits and attitudes toward human threats ensued and Rusty, the Moose Jaw, Saskatchewan native had the clue he needed about future encounters with a critter and a camera. The trip continued and no harm came to any of us, but a good lesson was learned, albeit after the fact. Never allow your enthusiasm overcome your need for caution when on the home ice surface of a more than adequate opponent. That is why they are called wild animals. It’s also why we, humans, are endowed with the ability to reason and determine the difference between good and bad before it gets ugly. Thanks for reading my latest installment. Woof. More from Jack, less from the bearded wonder. Shanahan.